I was reminded recently that four of the five boroughs of New York City are on islands. This came about as I rode Amtrak into Manhattan to attend a Volvo Ocean Race press round table in midtown. The event’s save-the-date email was rather neutral in tone, but nonetheless I persuaded myself something was afoot. This idea was boosted by the principals list on the invitation: Charlie Enright and Mark Towill, the leaders of the only U.S. entry in the VOR 2014 – 15; Mark Turner, the race’s CEO, and Brad Read, Executive Director of Sail Newport, the event’s only U.S. stopover. This, and the fact that the meeting was in a 23rd floor conference room of a Manhattan office building, could, I reckoned, mean only one thing: The Alvimedica boys were back in the game with a new sponsor. Well, not quite yet, apparently. Navigating oneself into Manhattan office buildings these days is a bit like sailing around the shipping in the Strait of Malacca. There were several checkpoints where you had to signal your sail (or driver’s license) number as you passed, your name was checked on the list, elevators that went only to the floor of your destination, and more doors to be buzzed through. Despite all this the view was, well New York’ish, and the coffee was hot, good and in abundance. Regrettably this was not the meeting to announce the boys’ new sponsor, although that was mooted further on in the morning. The attendees were a selection of Newport sailing water rats such as myself, Martha Parker from Team One, and Evan Smith, President and CEO of Discover Newport, as well as several freelance journalists. Mark Turner led off with remarks on the race, its history and some appropriate video clips that still bring forth great emotion, at least in me, as one contemplates the rigors of the race. Images of firehose sailing drenching fully suited guys and girls, grim faces with 2-week shadows (guys only) and bloodshot eyes contributed to the stressed look. I was reminded just what an enormous undertaking the race is. As anyone who has undertaken a normal ocean race – even a short one – knows, getting to the start is usually the hard part. Well, not in this case. The change in the last race to the one-design idea using VOR 65s has put the sailing back firmly in the laps of the sailors. Any sponsor with the wherewithal to sign off on the 10-15 million dollars/Euros to fund a VOR team is not going to do it by halves, so my sense is that the non-racing side, the preparation and shoreside support, is pretty straightforward, at least compared to the sailing. If we have any racing experience, especially in one-design classes, we are aware of the closeness of such racing. I was watching Laser frostbiting a couple weekends ago and from my position at the pin end of the finish of one race, I could not pick one boat over the other in a tight finish. Turner referred to this close racing aspect of the VOR in his remarks. Turner was the program manager for the Dongfeng Race Team program in the last race, and he told a story that could be the definition of the VOR. In this story, told with great and obvious pride, Dongfeng dismasted west of Cape Horn, while leading, and with a crew of apprentice Chinese sailors with a sprinkling of masters and led by a Frenchman, Charles Caudrelier. Caudrelier is a French merchant marine captain, a professional sailor, winner on Groupama in the prior race, and multi-time competitor (and event winner in 2004), on the Figaro Circuit in France. It’s in this latter regatta that one learns about really, really close ocean racing in one-design boats, in which finish times over 500 and 600-mile races are in single digits of minutes, or less. After the rig failed, Dongfeng made it to Brazil, got back on the horse and arrived in Newport just ahead of Abu Dhabi to take the leg win. One video clip shows the interview with Caudrelier right after finishing in Newport about Abu Dhabi being merely meters astern. This anecdote is a theme Turner returned to on the human side of the race; that it’s really about the people. All sports – nay, life itself – have moments of difficulty and moments of elation. Except for life itself, most sports finish in a day or so, or a few hours, minutes or seconds. Few last more than a week, except for ocean races. By their nature, offshore races are a fascinating test tube for how people react with each other, and relationships born inside a black carbon hole pounding upwind at 9 knots or blasting downwind at 29 last a lifetime. In Middletown, RI today, I am waiting for the snow to fly from the early February “blizzard.” It is presently blowing around 30 knots as measured by the roar of the trees (and 30 to 35 at Buzzards Tower), and rain turned to snow just a few minutes ago. I am warm, dry and comfortable, yet looking at the trees outside my window as I think about writing this essay, I can drift away to the inside of one of the 65s. I got a look inside Alvimedica last time with one of the young sailors I coach, so I have arguably a clearer vision of the insides of these boats than those who have not been so fortunate. The New York City theme returns and I think of the motion of an express subway car hurtling, hammer down, at rush hour. Imagine if you will, being outside in a snowstorm, but in the ocean – a mean, unforgiving, rough and violent ocean. It’s blowing 35 and expected to increase to over 40. You are cold and wet. You’re feeling like you just had a three-hour session at the gym, combining Pilates, cardio, and strength all together, and doing it on floor cranked at a 25-degree angle, moving in three axes at once as the fire sprinklers rain cold water down in you. One of your mates has noticed something odd up the rig. He needs to take a look, so you rig up a halyard and grind him up very slowly and carefully. The rig is of course also gyrating around on these three axes, but being 40 feet up in the air the range of motions is amplified with every foot he ascends. He’s hanging on for grim death and the occasional “Whump!” you hear is his head, rightly fitted with a crash helmet, banging into the rig. If perchance you are the skipper, a rare feat in itself, there’s the constant hum in the back of your mind; or rather you prefer to keep it in the back, of what happens if, well, something happens. Amongst all leaders, the good ones, the best in fact, the first rule is look after the most important assets, invariably the people. Watching the hand ascend the spar, you try to manage the strain of hoping he gets up and back without something happening. This existence would make the folks at the Department of Labor double up in laughter…“Yer kidding, no one works in these conditions.” Wrong: not only do they work in this environment, they sign up for it again and again. And so do the other 50 or so men and women riding their own black subway car, scattered around the tracks never very far from you. They’re eating roughly the same food and spending their days at the same gym, even the women and the young’uns. Unlike some sports there are very few sailing events, even at the elite professional level, offering prize money. The World Match Racing Tour and The Atlantic Cup are two that come to mind, but the VOR and even the America’s Cup are sailed for God, King and Country, but mainly mates. 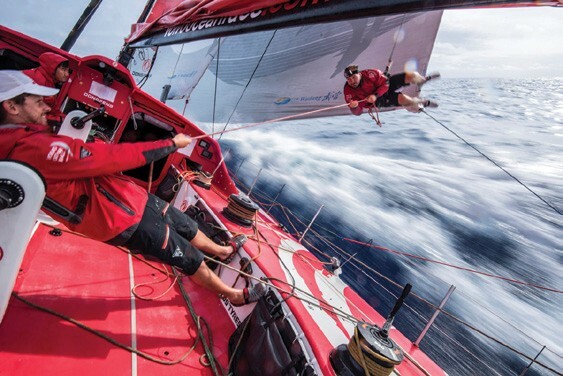 So, what is it about the Volvo Ocean Race that brings people back time and again? 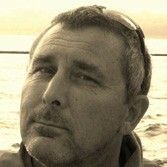 I think Bouwe Bekking, the Dutch sailor, has the record at seven Whitbread/VORs. That’s almost 30 years of this kind of sailing, every three or four years. There are a few sailors with four, five and six editions that have washed through their sea boots, so it obviously has attractions over and above the plush office and on-demand limo. We’ve probably all had an offshore passage or race where on arrival we said, “Never again.” Yeah, that turned out well, didn’t it? Think back on the stories: nearly always, regardless of the drama or the laugh, they circle back to the shipmates. This was a theme, the human story, Turner returned to again and again through the morning. Shared experiences are, quite possibly, the glue that keeps humans more or less together. Our schools, surfing spots, dramatic football or America’s Cup comebacks, including Larry’s, are all tiny nails or bits of glue keeping us all afloat. If we have something in common with another human, we are much more likely to get along with them than not. The more arduous the experiences, like the VOR and, I wager battle, the tighter the bond. Another innovation for the 2017-18 edition is the provision to each crew member of their own communicator, a one-way device to let them beam direct to their own social (well named in this case) media the experience of the moment. I’ll bet that will get politics off your Facebook feed. In the clip noted above of the Dongfeng dismasting, there is a scene where one of the crew holds up his hand so the On Board Reporter cannot see his face. Sailors are known for many things, but not wanting to get their two cents’ worth in on video is not one of them. I have written before on the breadth and depth of aspects of life that sailing can, and does, bring to bear for young people first dunking their toes into the bilge water of an Opti. The need to fertilize the next generation of sailors, to inspire them to aspire to races, experiences really, like the VOR is a pretty strong theme within the VOR management and certainly Enright and Towill. There is for this next race the requirement for two crewmembers to be under age 30. Combined with the new matrix of men and women crew combinations, introduced for the 2017-18 race to create more opportunities for women sailors, someone at the round table quipped that really good women sailors under 30 will now be in demand for VOR crews. Turner again picked up this theme by touching on rumblings within World Sailing to include an offshore component to Olympic sailing. While Olympic sailors certainly have skill in abundance, big boat skills – ‘seamanship’ – is generally not an aspect they can spend time on in an Olympic campaign, so opportunities to address this seem to have a wide benefit base. I asked Charlie about this, and what he thinks about on the topic when having his morning coffee. He confesses great appreciation for the break he and Towill (and others) got in the Morning Light program in 2007. To this end he is talking with Dawn Riley, surely one of the country’s most experienced and storied sailors, and the Executive Director at Oakcliff Sailing in Oyster Bay. Oakcliff is in the business of training sailors over and above being good 420 racers, so this seems to be close to an ideal mix. One of the freelancers asked what was available for families who did not sail but merely wanted an enjoyable experience in Newport. Brad Read, a major cheerleader for all things sailing, replied in spades. Short, column length version? Lots! Turner spoke a sentence with the words ‘new boat’ in it. “So, what will this be?” another asked. “Something appropriate to the race,” he responded with a smile. The two slides accompanying this answer showed the 30-meter tri MACIF and a monohull even more exotic looking than the current crop of foiling IMOCA boats. Other sentences included ideas on having the In-Port series in M32 cats; possibilities for a “second division” in the “old boats”; and for some portions of the race that would be Corinthian and aimed at the sponsors…more than this was not articulated. There was an interesting element on shrinking the race’s frequency to two years from the present three. Turner had yet another insight, gained no doubt from his years running OC Sports, that over a four-year cycle most likely a (or the) key decision maker who supports something like a VOR campaign would rotate out of the management team. A two-year cycle would thus offer the race and the sponsors a degree of continuity and a better ROI, the holy grail of sponsorship. My takeaway from this round table is that Volvo is committed to this event for the foreseeable future, which in this game might be 20 years without much of a stretch. And while it is a monumental race with lots going on, the experiences the people have to tell, before, during and after, are the important story. Volvo is in the business of making things on wheels. On my subway ride back to Penn Station, it occurred to me that trains are one thing Volvo does not make. On the other hand, they don’t have to – they have the Volvo Ocean Race.